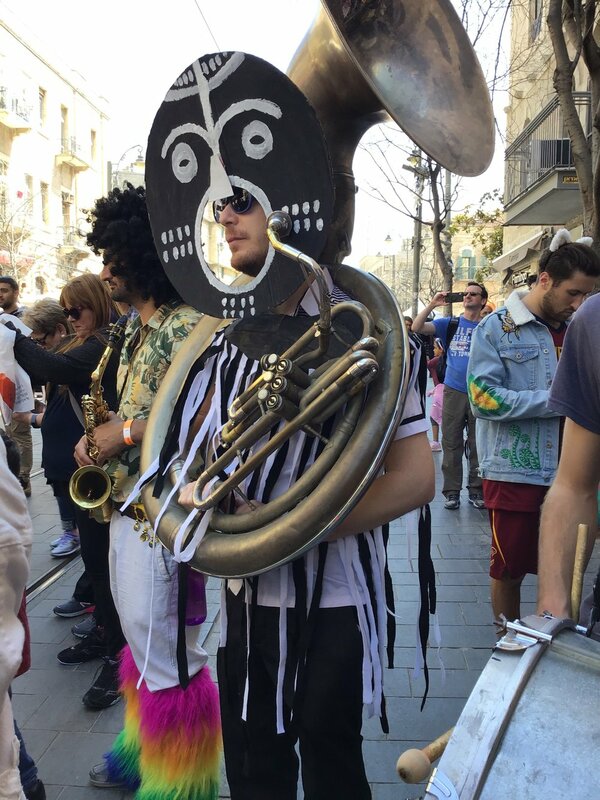 A band plays music in Jerusalem for the holiday Purim. Photo by Gil Zohar. JERUSALEM — Like clockwork, Israel's streets were taken over by myriad ballerinas, pirates and drag queens celebrating the Biblical holiday of Purim on the full moon of Adar, the last month of the Hebrew calendar. Many Israelis flocked to synagogues in costume to hear the story of Jewish redemption from a planned genocide in ancient Persia, recounted in Biblical book Esther. The Purim spiel is interrupted by noisy bells and whistles, and even firecrackers, each time the name of the villain Haman is read. While every year's celebration is raucous, if not drunken, this year Purim fell on Mar. 20-21, two weeks before the country's April 9 general election. Many could not resist the temptation to satirize and ridicule the country's leaders. The English-language daily The Jerusalem Post ran its annual Purim spoof, The Jerusalem Roast, featuring an article that the Central Elections Committee announced that the election will be held on April Fools' Day "in recognition that Israel's democratic form of government is a joke." Similarly, satirical news reported that “Donald Trumpet” [sic] had recruited “Netanyoohoo” [sic] as his running mate in 2020. Israelis dancing during the Purim festival Mar. 22 in Jerusalem. Photo by Gil Zohar. Not to be outdone, Justice Minister Ayelet Shaked tweeted a Purim spoof of Yves Saint Laurent's perfume Opium, calling it Fascism. Shaked sprays the perfume then says the whiff smells like democracy. While Israelis, many of whom don't take the country's politics too seriously, thought the faux-ad was a clever jab, some people - particularly foreign journalists who do not understand spoken Hebrew or Israeli culture, misinterpreted the humor as proof of the wicked ways of the Israeli right, and the country in general. Some Leftists also failed to get the joke, which they misunderstood as a leading Right-wing politician’s supposed disregard for democracy. Responding to the buzz that Shaked’s political spoof inspired in Israel and abroad, the justice minister said that the left can’t take a joke. “It is a nice clip aimed at the liberal left that has for years called me a fascist but keeps losing the elections,” she said, the Times of Israel reported. Meanwhile, a pox on the sourpusses who can’t take a joke. And stay tuned for the results of the April 9 general election, when Israelis will be laughing at themselves. His tweet upended years of US policy, and surprised members of his own Middle East peace team, the State Department and Israeli officials, according to McClatchy news service. Israel seized the Golan Heights, a 400-square mile expanse, from Syria in 1967 during the Arab-Israeli war. The United Nations has always rejected Israel’s occupation of the area. Some people dress up in loud and whacky costumes for Purim, similar to Halloween. Photo by Gil Zohar. All of which is to say that in the Trump White House, every day is Purim.